Visualization is the key to effective public speaking. You have the power to create your desired speaking outcome. Why would anyone choose fear? Choose confidence. Visualize success. Learn how. Think positive! Fear is "stinkin' thinkin'. You have more power than you think. And it's all in your mind. Confident Public speaking is a state of mind. 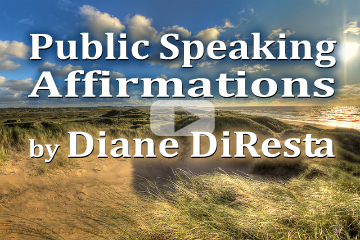 Public speaking doesn't have to evoke fear. Breath deeply. When we're in a fear state we tend to hold our breath. Psychologist Roger Wolger once said something to the effect of " Anxiety is an interruption in respiration." To work through fear, breathe deeply. Focus on the breath.